Amazon.com description: Product Description: A series of short stories and legends is the work from the Polish author, Henryk Sienkiewicz. 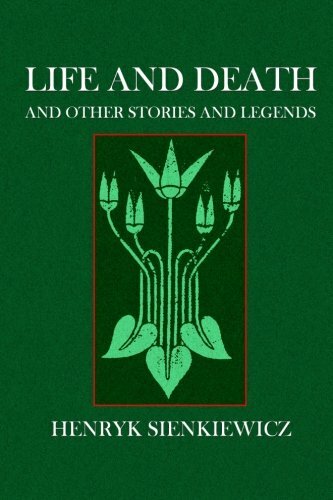 This collection consists of five stories, entitled Ã¢ÂÂLife and Death: A Hindu Legend,Ã¢ÂÂ Ã¢ÂÂIs He the Dearest One?Ã¢ÂÂ Ã¢ÂÂA Legend of the Sea,Ã¢ÂÂ Ã¢ÂÂThe Cranes,Ã¢ÂÂ and Ã¢ÂÂThe Judgment of Peter and Paul on Olympus,Ã¢ÂÂ and is translated by Jeremiah Curtin, under the title Ã¢ÂÂLIFE AND DEATH and Other Legends and Stories". The book is illustrated with photographs of the estate, in Poland, which was given to the novelist by the Polish people on the occasion of the twenty-fifth anniversary of his literary work. The initial story, Ã¢ÂÂLife and Death, a Hindu LegendÃ¢ÂÂ, was read by Sienkiewicz before an enthusiastic audience in Warsaw shortly before the bookÃ¢ÂÂs publication. About: A series of short stories and legends is the work from the Polish author, Henryk Sienkiewicz.